For private clinics and hospitals, special printed files for patients. We have carved a niche amongst the most leading names in this industry, affianced in presentingReport File. 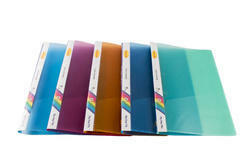 Our offered array is used to bind the files papers and documents. These are accessible in market at budget friendly rates. We have gained expertise in delivering a quality range of Transparent Report Files with Side Pocket to our valued customers across the nation. Our professionals manufacture these products using premium quality plastic & other raw material and components that are procured from the certified vendors of the market. - Available in various colors with F/C size. - Pull out swing lock report cover. - Large size enabling you to keep any size of papers. Ideal for a small number of punched papers. 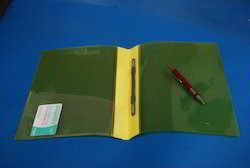 The left side pockets allows safe holding of additional loose leaf papers. Leveraging over the skills of our qualified team of professionals, we are engaged in providing Report File.